BlogNews is a multi-purpose and stylish magazine theme with a unique homepage that is aimed to those who want a more professional feel to their site. With 7 alternate styles and advanced theme control panel options the theme gives ability to run a Newspaper or Magazine style website. Blog layouts are boring! Your category page no longer needs to be a bland list of articles. Take the advantage of unique magazine style layouts. 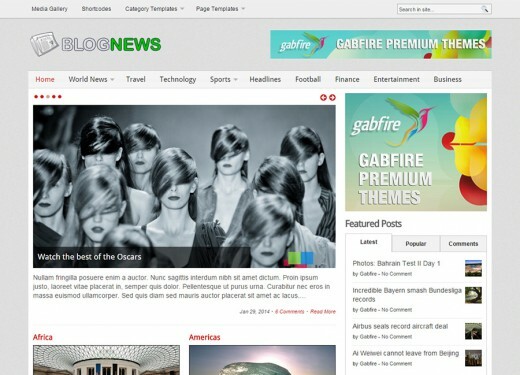 BlogNews packed with multiple pages templates including Archives, Full Width, Left Sidebar and some custom templates. Multiple built-in header types designed to your liking. Simply select the header type you want from the theme's control panel. No coding required. Videos don't have to be difficult. BlogNews has an amazing HTML5 player for locally hosted videos HTML5 with subtitle support. You upload the photos and leave the rest to BlogNews. It will automatically grab all the uploaded images and display them above the entry with a neat slider. Videos and pictures don't have to be difficult. Gabfire Media Module extends the functionality of WordPress Featured Image to support videos and Default Post Images. International? No problem - BlogNews was built to work with multiple languages. It is also compatible with WPML's multilingual plugin. Designed with search engine optimization in mind, sites running our themes get maximum exposure on the web resulting in great traffic. Change settings quickly through our control panel. See why users are amazed by the number of configurable options baked into every theme. We stand behind our themes! That's why we offer a 14 day no questions asked money-back guarantee.